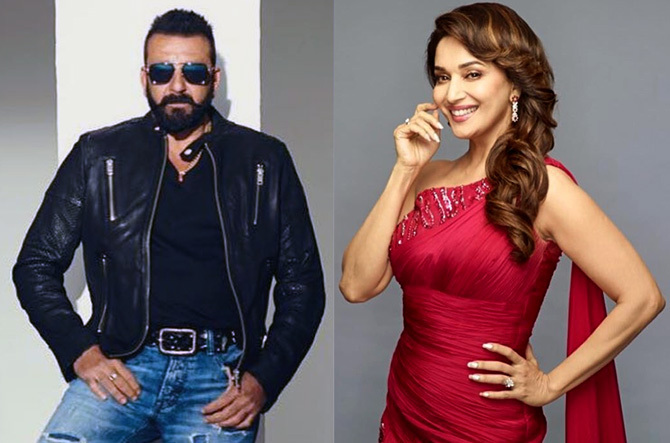 Madhuri Dixit and Sanjay Dutt Dutt will reunite after 21 years. Looking back at their chemistry. Bollywood loves a good looking jodi, and Sanjay Dutt and Madhuri Dixit certainly fit the bill. Everybody loved the combination of his reckless, brawny, appeal next to her million-dollar smile in hits like Saajan, Thanedaar and Khalnayak. And like all hot pairs on celluloid, the duo stirred up the grapevine over their alleged romance. Madhuri's conspicuous silence following Dutt's arrest in connection with the Mumbai serial blasts of 1993 nipped any hope of a future in the bud. More than two decades later, Mrs Nene and Mr Dutt are cast opposite each other in Abhishek Varma's multi-starrer Kalank. For everyone who is as excited as we are about this reunion made in celluloid casting heaven, Sukanya Verma presents a timeline of their reel-life chemistry. IMAGE: Madhuri Dixit and Sanjay Dutt in Khatron Ke Khiladi. Dutt and Dixit ran around trees wondering, 'Hum dono main kuch na kuch toh hai. Jaane iska kya naam hai?' in the T Rama Rao potboiler, Khatron Ke Khiladi. It's called chemistry and D & D demonstrated tons of it in their first outing together 30 years ago. The multi-starrer's tired lost-and-found theme is as forgettable as it gets, but the magic between its fetching leads made sure to grab eyes. IMAGE: Raakhee, Madhuri Dixit, Mithun Chakraborty, Amrish Puri and Sanjay Dutt in Ilaaka. In Ilaaka, another typically 1980s schlock about good taking on evil, Mads romanced Mithun Chakraborty while Dutt twinned with Amrita Singh in khaki uniform. They don't have any scenes together except a blink-and-miss moment of its Sholay-inspired climax. IMAGE: Sanjay Dutt and Madhuri Dixit in Kanoon Apna Apna. Dutt hoped to recreate the success of Vidhaata with co-star Dilip Kumar and Naam mommy Nutan, even engaged in an awkward lip lock with Madhuri to spring some life into the delayed, drab, Kanoon Apna Apna. 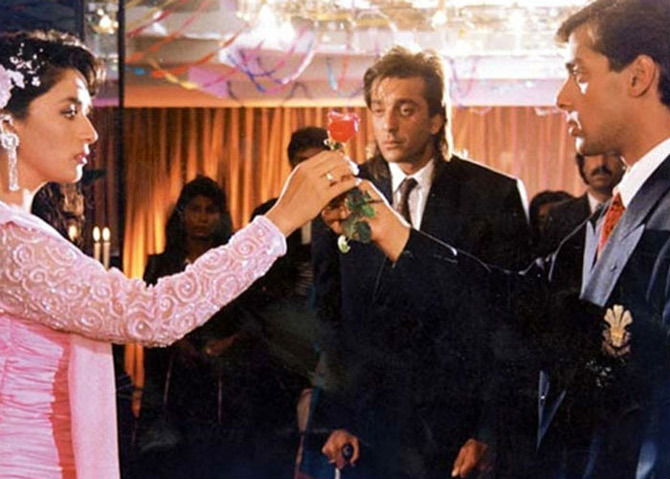 IMAGE: Madhuri Dixit and Sanjay Dutt in Thanedaar. There was a time when one chartbuster could lift a mindless movie's fate and turn it into a resounding success. Madhuri-Sanjay boogying to the super infectious, shamelessly unoriginal, Tamma Tamma in Thanedaar is a case in point. Moreover, next to one of the best dancers in the business, you almost don't notice Dutt's two left feet and gangly body language. IMAGE: Madhuri Dixit and Sanjay Dutt in Saajan. After a string of lousy masala flicks, the pair finally hit the jackpot as a jodi in Lawrence D'Souza blockbuster Saajan. A classic love triangle about two best friends falling for the same girl was lapped up by audiences for its breezy chemistry and Nadeem-Shravan's lilting soundtrack. IMAGE: Madhuri Dixit, Sanjay Dutt and Salman Khan in Saajan. 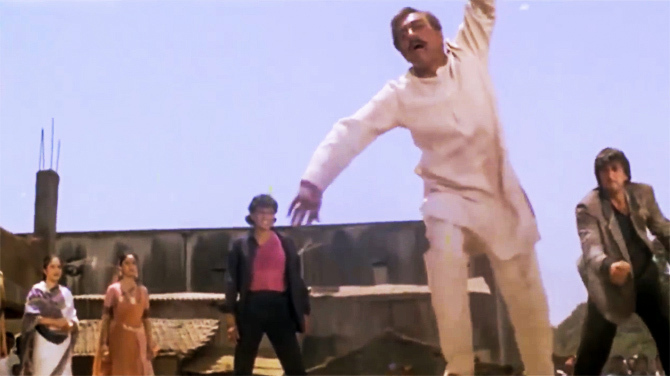 Cast against type as a shy poet with a walking disability, Dutt flexed his potential beyond action hero roles while his gentle chemistry with Madhuri and brotherly camaraderie with Salman Khan evoked sympathy. IMAGE: Sanjay Dutt, Madhuri Dixit and Salman Khan in Saajan. Despite a far-fetched final scene, Saajan's massive success not only pulled it off, but also catapulted its leads to another league of stardom and re-energised rumours of Sanju-Mads link-up with further gusto. IMAGE: Madhuri Dixit and Sanjay Dutt in their biggest hit together, Khalnayak. Sanjay Dutt's villainous turn and violent looks, Madhuri Dixit's provocative Choli ke peeche inquires marked the tone of Subhash Ghai's controversy-ridden Khalnayak. IMAGE: Sanjay Dutt and Madhuri Dixit in Khalnayak. Its release close on the heels of Dutt's arrest under TADA invited uncomplimentary comparisons of life imitating art. Even so, Khalnayak was a huge hit and the popular pair's chemistry was very much appreciated. IMAGE: Sanjay Dutt and Madhuri Dixit in Sahibaan. In Ramesh Talwar's Himachal-set romance, Dutt's lustful eye disrupts Madhuri and Rishi Kapoor's modest courtship, resulting in inevitable tragedy. The sluggish melodrama of Sahibaan never stood any chance. IMAGE: Mahaanta, Sanjay Dutt and Madhuri Dixit's last film together. Perhaps the seriousness of Dutt's blunder and Dixit's distancing herself from the matter completely had a debilitating impact on their once sizzling chemistry. Perhaps the audience had moved on to marvelling Dixit's far more potent passions around Shah Rukh Khan in Dil To Pagal Hai. Whatever may be the case, there was simply no enthusiasm for their long-in-the-making, Mahaanta. Still a year to go, but the certainty of seeing two of the 1990s' biggest superstars face off in a biggie featuring some of the hottest stars of today is the casting coup of 2019. Did you like the Sanju teaser? VOTE!